The heat of the year is starting to drive some populations of insects. 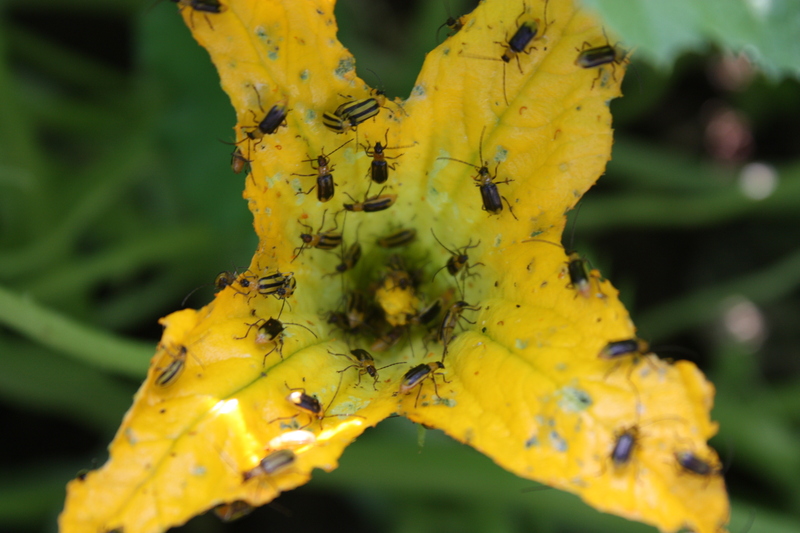 We are starting to see increased populations of japanese beetles and large numbers of cucumber beetles http://learningstore.uwex.edu/Cucumber-Beetles-P557.aspx and western corn rootworm adults http://hort.uwex.edu/articles/corn-rootworms. The beetles are severely attacking the blooms and even the vegetative growth of the vine crops. The cucumber beetle can be devastating in particular. Besides destroying blossoms they also transmit bacterial wilt(http://hort.uwex.edu/articles/vine-crops-disorder-bacterial-wilt-0), which will ultimately lead to the death of infected plants. In our garden we have not seen the numbers like we have this year. Especially this early in the season. Because we manage our vegetables organically we have sprayed for the beetle using a certified organic compound Pyganic. This pesticide effectively knocks down the population. It does not have a long-term persistence in the environment. This entry was posted in disease, Fruit, garden update, Pests, Plant Development, Vegetables and tagged Dane County, flowers, fruit, garden educational programs, gardens, madison, organic, plants, University Display Gardens, vegetable trials, vegetables, wisconsin by bemerson. Bookmark the permalink.